The brewing process was pretty close to our other Milkshake IPAs, with the grains for the mash remaining the same. The most noticeable modification was done in the dry-hopping process, as we switched up the hops for Huell Melon and Galaxy. 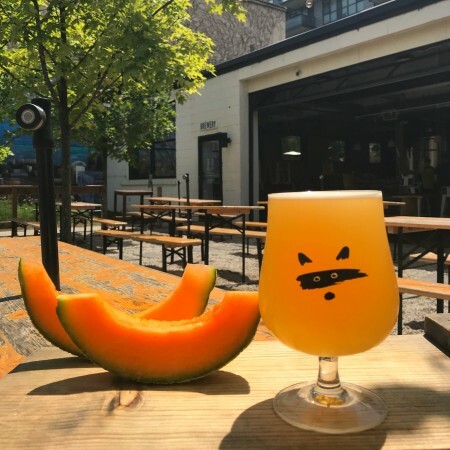 Huell Melon was a clear (and perhaps obvious) choice for us, as it helps to bring forward the melon aroma before the beer even hits the palate. This hop variety is also known for its slight tart strawberry aroma, which perfectly compliments the “melon-ness” of the beer. The Galaxy hops work great in this beer due to their heavy compound of essential oils that provide the beer with some tropical aromas such as pineapple, a hint of citrus, and some stone fruit character. The lactose addition helps to bring out the sweetness of the cantaloupe and makes this an extra smooth and refreshing beer. YY*→PMI is on tap now at Bandit while supplies last.